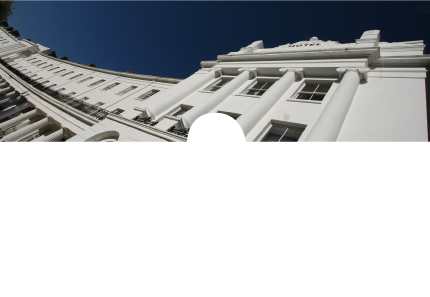 The Anglesey Hotel is situated in Alverstoke Village on the Gosport peninsular. It is an elegant Georgian Building dating back to the 1830’s and stands as Gosport's largest hotel. The hotel has unparallel views of the Solent and the Isle of Wight as well as Portsmouth, Gun Wharf Quays and the Spinnaker Tower. The Anglesey Hotel is ideally situated for those visiting the area for business or pleasure and now with 26 en-suite bedrooms the hotel is large enough to cope with most large business or family groups. Our rates include bed and breakfast and complimentary WIFI. Many of our guests enjoy walking on the sea shore at Stokes Bay (5 mins walk) taking in the fresh sea air and watching the very busy waterway, that is the home training ground for many internationally famous yachts people, also taking refreshment at the fine beachside cafés. Other Guests not so energetic will often take their morning tea in the award winning Crescent Gardens that is 20 metres from the hotel front door. Purchase an Anglesey Hotel Voucher.